Modem over IP (MoIP or V.MoIP) provides a solution to connect analog modems to digital networks. Modem over IP enables legacy dial up modems to communicate over mobile, radio, satellite (Iridium, etc) and other IP networks. Contact us for additional information to discuss your Modem over IP and MoIP application needs. ITU V.150.1 identifies different modes for transmitting modem over IP networks. Modem Relay – the audio signal from the local modem is demodulated at the near end Analog Modem Adapter (AMA) and transmitted over the network and re-modulated at the far end AMA for transmission to the local modem. The AMA devices maintain state for the call session. Modem relay mode may be used for more reliable communications over networks where transmission delays and packet loss may degrade modem communications. Voiceband (VBD) – audio is encoded by a speech codec such as G.711 and transmitted as data packets over the network. VBD mode may be used over reliable networks with predictable throughput and negligible packet loss. 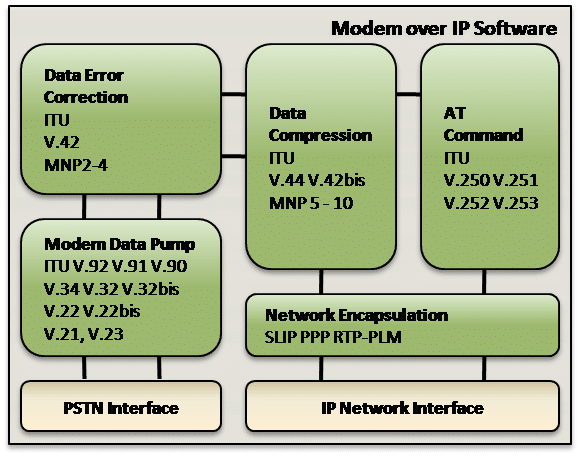 VOCAL’s SIP Software Modem technology provides dial up networking services by combining a soft-modem and VoIP channel module to implement an analog modem using SIP and RTP. This is a combination of SIP, VBD Mode, and a Soft Modem. The VOCAL SIP Analog Modem Server (SAMS) is an implementation of this, that can run in a data center, and replace modem banks and E1/T1/ISDN lines with pure software. Remote Access Server over IP is an alternate method where information encoded in the local modem audio signal is demodulated and decoded at the AMA and transmitted as data over the network using protocols such as TCP/TLS, Telnet or Text over IP. The Vocal AMA uses this method to pass modem data over an IP link that is not well suited for VBD mode. The AMA can be combined with a SAMS server using VOCAL MoIP server modules to solve almost any modem over IP problem. An Analog Modem Adapter, also be referred to as an Analog Telephone Adapter (ATA), enables legacy analog modems to communicate over digital networks using IP protocols. AMAs support telephony features such as device power, dial tone, ringing and telephone signaling to interact with the local modem. VOCAL’s MoIP software is part of a fully integrated and highly configurable VoIP software solution with a Network Stack, SIP Stack, secure communications, full-featured Telephony software, and a comprehensive data modulation and data modem software library. Supported data modulations include V.34, V.32, V.32bis, V.22bis, V.22, Bell 212, V.23, V.21, Bell 103, V.90, V.91 and V.92 modem standards as well as standard fax modulations. Our software also supports higher data protocol layers including V.42 (including MNP2-4), V.42bis, V.44 and MNP-5. VOCAL’s MoIP software library is modular and optimized for DSPs and conventional processors from TI, ADI and other leading vendors. Our MoIP software is available for licensing as a library or a complete AMA design with custom solutions available.